Strawberry Shortcake ~ not the classic way!!! Okay, let me first explain why this is not the classic way. Firstly I didn't have a round cookie cutter and hence it does not by any chance resemble a classic shortcake. Secondly I used whole milk to gather the dough while the original recipe calls for full cream. Adding cream makes it rich and thats what a strawberry shortcake is but as I didn't have cream on hand I used whole milk. Nevertheless the shortcakes were light crumbly soft and buttery. I made these beauties last week for Rakshabandan. As a virtual sweet treat for my bro who lives miles away and then they were devoured by the huss and munchkins. Both the boys loved the shortcakes as it is and munchkins was there by my knee for second helpings of the biscuits. The huss found the berries to be too tart and so piled his shortcake with dollops of whipped cream. BTW, he is not a big strawberry fan. But I found the combo just perfect. However you can adjust the sugar depending on how tart your berries are. I so have to talk about the biscuits. They were soooooo goooooooood. Soft, crumbly, flaky, buttery and melt-in-the-mouth. 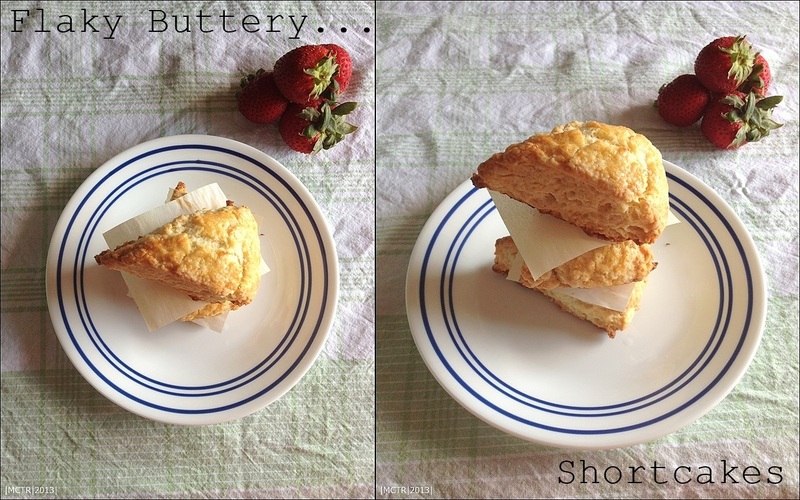 If alone, I had added a wee-bit more sugar in the dough, the biscuits would have never made it to the shortcake part. I saved some of the biscuits and we had them the next morning with strawberry jam which were equally good. I strongly recommend or urge or whatever but do try the biscuits atleast, adding more sugar to the dough, you would definitely love it. As for the cookie cutter, it has been shared as part of the wishlist with the huss and I can expect one in the near future and when I get one, I will surely update the blog with the classic version and I will try and make it eggless. First prepare the strawberries. Slice the berries into 1/4 inch thick, sprinkle the sugar and mix well. You could crush a few berries. Let the berries sit at room temperature for at least 30 minutes. To make the biscuits, preheat oven to 425F. Line a cookie sheet with parchment paper. In a small bowl, beat the egg and heavy cream with a fork. Mix in the buttermilk. Whisk together the flour, sugar, baking powder, salt and baking soda. Using a fork or with your hands, work the butter into the flour mixture till it resembles coarse breadcrumbs. Make a well in the center of the flour mixture and pour in the cream mixture. Mix until the dough is evenly moistened and just comes together. Gather the dough and gently knead it three or four times. If the dough seems dry, work in more cream, 1 tsp. at a time. Transfer the dough to a lightly floured surface and roll it into a 3/4 -inch-thick disk. Cut it into 8 pieces, just the way you would work with scones. Lightly brush the biscuit tops with egg. and bake for 10-15 mins. Let the biscuits cool slightly while you whip the cream. Using a serrated knife, split the warm biscuits in half horizontally. Spoon the macerated berries and their juice evenly over the biscuit bottoms. Top with a generous dollop of whipped cream and cover each with a biscuit top. Spoon more berries and cream over each shortcake and serve immediately. Who cares about the shape? Strawberry shortbread is strawberry shortbread :) They look great. I'd love to see your eggless version when you try it. Classic way or not I loved the way you have prepared and presented the cake. Wonderfully prepared. Omg, i dont have strawberries now, wish i have some to make this incredible short cake. Love this dessert.. Looks super yummy! Very delicious, who cares about the shape..
Who cares for the classic way when the end result is just as delish! Short bread looks so colourfull. loved it. Vimitha, they may be not classic but they turned out so pretty and yummy!